President Trump signed an executive order allowing The Treasury Dept. to place crippling sanctions on North Korea. Surprisingly China is cooperating. The “supreme” leader of North Korea has long believed it his duty to utterly destroy the United States, who he and his predecessors blame for the results of the technically-still-raging Korean War. U.S. support for South Korea is, of course, one of the main points of contention among the DPRK leadership, but their incessant threats aimed at America have created new and unnerving diplomatic issues between the two nations. Beyond the war of words, of course, is the very real possibility of a military conflict erupting between the U.S. and North Korea. With Kim Jong Un constantly sending missiles skyward, and in the general direction of American allies, it is only a matter of time before Donald Trump is forced to take serious action to curb Kim’s chaotic regime. In a last-ditch effort to prevent bloodshed, Trump today announced a new round of sanctions against North Korea during a meeting with his South Korean and Japanese counterparts. Trump signed an executive order expanding the authority of the U.S. Treasury Department to target individuals, banks and other companies that finance or facilitate trade with North Korea. “Our new executive order will cut off sources of revenue that fund North Korea’s efforts to develop the deadliest weapons known to humankind,” the president said. While the sanctions could affect businesses throughout the world, Trump said they’re squarely aimed at Pyongyang. “I want to be clear. The order targets only one country, and that country is North Korea,” Trump said. “Foreign banks will face a clear choice: Do business with the United States or facilitate trade with the lawless regime in North Korea, and they won’t have so much trade. TRADE: The E.O. directly targets North Korea’s shipping and trade networks and issues a 180-day ban on vessels and aircraft that have visited North Korea from visiting the United States. This ban also targets vessels that have engaged in a ship-to-ship transfer with a vessel that has visited North Korea within 180 days. North Korea is dependent on its shipping networks to facilitate international trade. FINANCIAL INSTITUTIONS: The E.O. 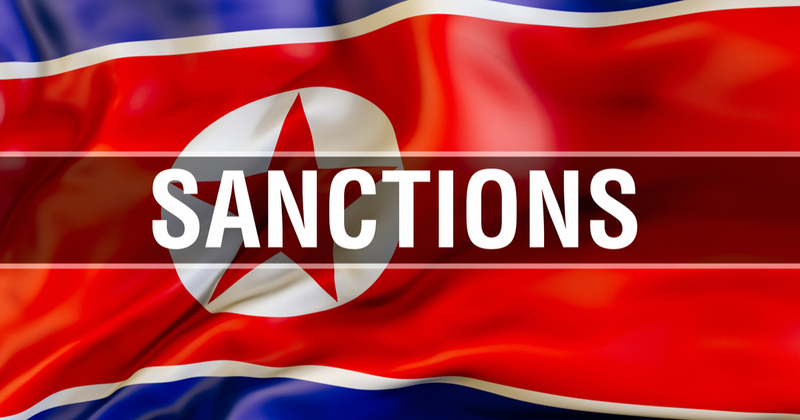 provides the authority to impose sanctions on any foreign financial institution that knowingly conducts or facilitates any significant transaction on behalf of certain designated individuals and entities, or any significant transaction in connection with trade with North Korea, on or after the date of the E.O. The E.O. also provides the Secretary of the Treasury additional authority to block any funds originating from, destined for, or passing through accounts linked to North Korea that come within the United States or possession of a U.S. person. Foreign financial institutions must choose between doing business with the United States or facilitating trade with North Korea or its designated supporters. Perhaps most significant was the surprise announcement that China’s Central Bank is playing along. They have instructed every bank in China to stop dealing with North Korea. Mnuchin said any sanctions issued under the new executive order signed by U.S. President Donald Trump on Thursday would be forward-looking and not target past behavior. In other words, whatever a company did in the past doesn’t matter, they will only be sanction for what they do beginning with the signing of the executive order. Kim Jong Un has repeatedly ignored international warnings regarding his nuclear weapons programs and has utilized his propaganda arm to continually antagonize the United States. Furthermore, humanitarian organizations have been ramping up awareness in recent days regarding North Korea’s heinous and amoral use of concentration camps and forced labor in an effort to drum up support for a physical intervention on behalf of the North Korean people. Earlier this year, American prisoner Otto Warmbier was returned to the United States from just such a camp after falling into a coma over a year prior. Warmbier died shortly after returning home, after showing no signs of brain activity while stateside. The American had been convicted of removing a poster from a hotel wall in North Korea and sentenced to 15 years of hard labor. Warmbier fell into a coma just days into his sentence, likely at the hands of violent North Korean camp staff.